This post is targeted at parents or soon-to-be parents who would benefit from skipping some frustrating learning experiences with inferior child-proof lock solutions. Too long didn't read (TLDR;) version: Consider a magnetic locking system to secure cabinets and drawers from young children. Generally speaking, we don't want those we love to come to harm. Sometimes that means setting and enforcing limits so children can grow and develop in relative safety. Other times we just want to stop the little monsters from breaking our stuff. The goal is the same regardless of the driver, and that goal is a child-proof lock that works. These two requirements are worth thinking about. As you can imagine, it can be tricky for a product to satisfy both, but doing so is the whole point. In my experience, most cabinet locks land somewhere in the left two quadrants because they eventually fail to be effective, which also happens to be the least safe way to fail. The few that stand the test of time in terms of effectiveness are often less than awesome at satisfying the ease of use requirement. What's wrong with all of these locks? In Authentication Factor terms, most child-proof devices rely on a knowledge factor (what you know) and a rudimentary inherence-like factor (who you are). Most fail to include a possession factor (what you have) as an additional layer of security. For child locks, the "what you know" is rarely some secret changeable passphrase; it's usually just a permanent method to disarm the physical mechanism. In classic security through obscurity fashion, once an attacker (i.e. child) learns how to bypass the device, the "what you know" authentication factor is forever stripped away as an effective layer of protection. Most child-proof locks also include a thin layer of "who you are" protection. Since checking biometric identifiers (like a fingerprint) are impractical for this application, authorization is usually proven via adult-sized feats of strength, coordination, or dexterity. The idea is that even if the attacker employs powers of observation and creativity to identify methods to defeat the device, only an authorized user is actually capable of pulling off the heist. Effectively child-proof devices that also lock out grandma land in the lower-right quadrant. Magnetic locking systems are a superior child-proofing technology because they rely on an additional protection: the "what you have" factor. A lock that opens with a physical key is not particularly ingenious, but traditional mechanical locks are overkill for most families and have drawbacks such as high cost, obtrusiveness, inconvenience of key management, tediousness of locking/unlocking, etc. 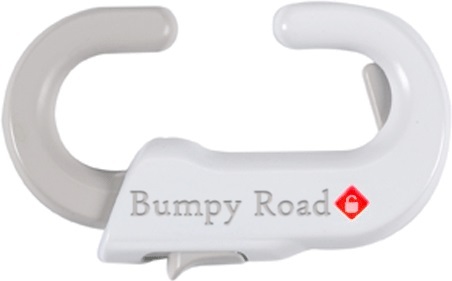 The child-safety industry has brought numerous locking solutions to market, though precious few with good usability that also remain effective over time. Magnetic locking systems, on the other hand, get the job done and feel more family-friendly and convenient than tumbler-style or other mechanical-keyed locks. Though they may take longer to install than locking systems that simply tighten around existing cabinet handles, the additional upfront effort will likely avoid a larger effort spent defending inadequately protected drawers, or worse, recovering from the fallout of a breach. All things considered, magnetic locking systems hit a sweet spot for child-proofing cabinets and drawers. Here's a quick video (not mine) of the lock in action.  Tip: An easy home for a magnetic key is a tall ferromagnetic object... like a refrigerator. We stick ours to a metal car key shelf which is high and centrally located.  Tip: If you want to have multiple keys to spread around, you don't have to "splurge" on official brand-name keys or go wild with strong neodymium rare-earth magnets; any magnet with a few pounds of pull strength sufficient to trigger the latch through your cabinet door will do. In practice these locks require stronger magnets than those you'd typically find on refrigerators or in children's toys, so most enterprising youngsters won't be able to open locked doors with their own toy magnets.  Tip: If you're willing to put screw holes inside of your wood cabinets or drawers, the Safety 1st magnetic latch mechanism is flexible in that it supports top, sideways, and upside-down configurations. This allows you to install the locking mechanism in more locations along different edges. Some competing systems use a tool-free adhesive mount but are only designed for top cabinet installation. Usability is among the factors that distinguish good products from bad. While product quality may not be the most important factor in a startup's success, it's clearly a bankable differentiator that stirs people's passions (myself included)! If you are interested in creating better products, I recommend reading What Does Usability Mean: Looking Beyond ‘Ease of Use’.